What an exhilarating way to end the season – to be where the action is, sailing against the country’s top teams for a coveted spot in the 18-team ICSA Co-Ed Nationals fleet! Such was the situation we found ourselves in at the start of our summer as we competed in the Eastern Bracket of the Semi-Finals at St. Mary’s College of MD on June 3-4. Instead of our normal routine of leaving campus on a Friday evening, we found ourselves piling into the old minivan at 39th and Spruce on a Monday just after noon. The six of us, including Mac Agnese, Catie Hopkins, Cary Kane, Nina Kaledin, Joe Farned, and myself, crammed ourselves and all of our gear into the van for what we hoped would be a four-day excursion. Unlike any other college regatta, or any other national championship prior to this year, all 36 semi-final teams would be at the national finals. However, only 18 would earn the right to sail in the championship. Think of it like making the cut in a major golf tournament, or winning a first-round game at the NCAA tournament (if only Penn could do that….). The format for the semi-finals was, like the past six years, two fleets of 18 boats determined by seeding. The top 9 from each side, “East” and “West” would advance to the final fleet. We qualified for the semis by placing an all-time best 5th in our spring conference championship, but now it was time to prove we belonged in the finals. The first day of the regatta dawned with light but steady breeze and generally perfect conditions for racing. It was the first time since beginner Optis that I felt pre-race nerves as Cary and I sailed to the starting line. It didn’t take long for those to dissipate after we nailed our first start, winning the pin and sailing to a 4th place finish! We placed 10th the next race giving us a solid position to work with. 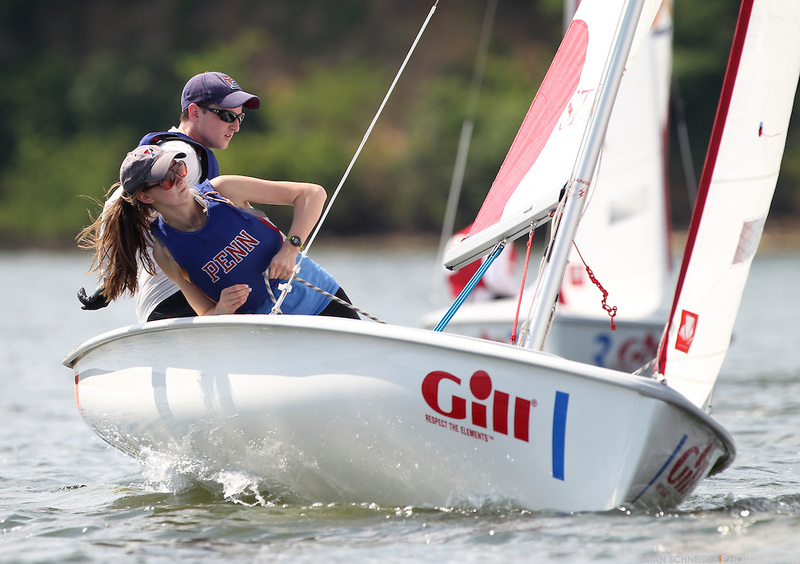 Mac and Catie sailed next, earning two mid-fleet finishes in B Division to put us in 10th place, only 2 points out of the coveted 9th qualifying spot. Unfortunately the breeze did not cooperate for the rest of the day, forcing the race committee to send us home with only two races in the books and a relatively bleak wind forecast for the following day. But Wednesday arrived with a solid breeze around 5-8 knots, allowing both A and B Divisions to get in two more races before the wind shut off. Mac and I both sailed consistently by getting 7, 10 and 8, 9 respectively. However, we were still two points out of qualifying after 4 races in each division, so we prayed to the wind gods to deliver a sea breeze sometime before the 5:00 cutoff time for racing. They delivered, bringing in a light southerly across historic Church Point around 3:00. The officials scrambled to set a course and get in additional races. At this point, it was a dogfight for the last spot between us, Wisconsin, Michigan, and UC Santa Barbara. Knowing we would only get two more races each, both Mac and I kept close tabs on those teams off the line. After one more A Division race, we were just inside of qualifying, edging out Wisco by one point. But from there things started to get messy, and our relative inexperience in national competition began to show. We couldn’t quite get it done in either division, losing out to both Wisco and UCSB giving us an 11th place finish. It was a little disappointing to have to go home early. But having taken a step back to look at just how far we’ve come this year, I can only conclude that our finish at Semi-Finals is simply the next step on our journey to becoming one of the top programs in the nation. Far from being discouraged, we are excited to get back on the water come August!